It’s almost that time again – standardized testing is right around the corner. 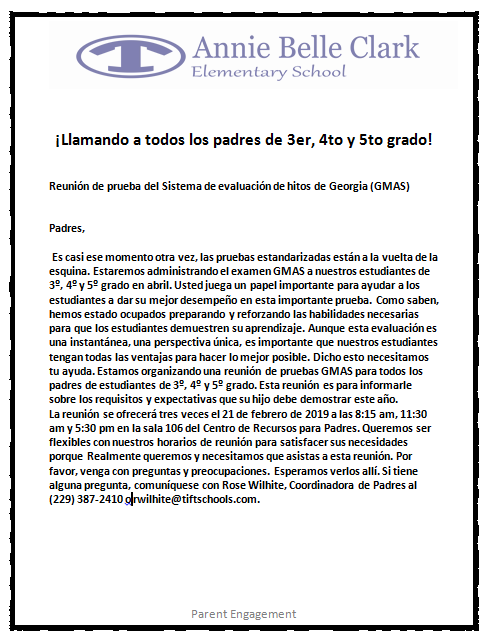 We will be administering the GMAS Test to our 3rd, 4th, and 5th grade students in April. It’s almost that time again – standardized testing is right around the corner. We will be administering the GMAS Test to our 3rd, 4th, and 5th grade students in April. You play an important part in helping students give their best performance on this important test. As you know, we have been busy preparing and reinforcing the skills necessary for students to demonstrate their learning. Even though this assessment is a snapshot—one single perspective – it is important that our students have every advantage to do their very best. With that being said we need your help. 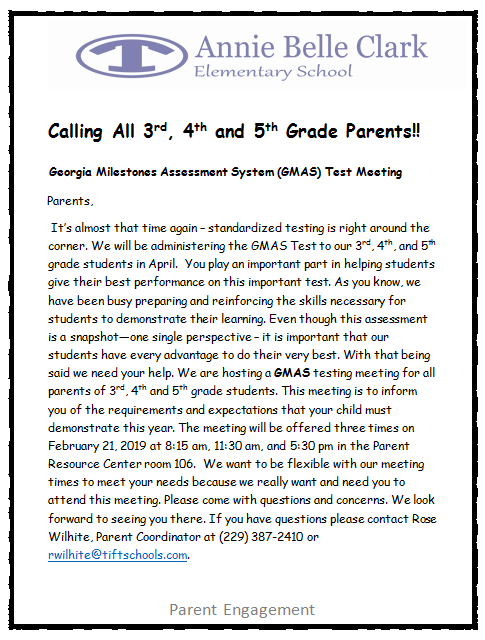 We are hosting a GMAS testing meeting for all parents of 3rd, 4th and 5th grade students. This meeting is to inform you of the requirements and expectations that your child must demonstrate this year. The meeting will be offered three times on February 21, 2019 at 8:15 am, 11:30 am, and 5:30 pm in the Parent Resource Center room 106. We want to be flexible with our meeting times to meet your needs because we really want and need you to attend this meeting. Please come with questions and concerns. We look forward to seeing you there. If you have questions please contact Rose Wilhite, Parent Coordinator at (229) 387-2410 or rwilhite@tiftschools.com.